Learning Target: Create an original book cover design that illustrates your knowledge of page layout, typography and photography. Utilize your own original photography in the design of the cover. Present and Respond to student art work through verbal and written critique process. Tuesday: Last in class day to complete Book Cover design. Must be printed and presented in critique covering the actual book with flaps and all. For EXAM day have the following completed. Image file of every project we did deposited into the Google Folder for each assignment. Make sure these are in focus, cropped to only include the image and saved as jpg files (high resolution). If project was completed in Illustrator it can be an Illustrator file (ai) or pdf. MAC LAB SHARE drive folder with your name on it with every project file we did. See Exam rubric for details. Learning Target: Create an original book cover design that illustrates your knowledge of page layout, typography and photography. Utilize your own original photography in the design of the cover. Monday:Meet with me to discuss your plan for the book cover design project. The following should be completed and prepared for this meeting. Finished Wiki Research Pages explaining the 3 examples of book cover designs that you were inspired. See wiki for details of what to include. Written synopsis of the book you will be designing a cover for. This should be written in your own words and include the title and author of the book, what the book is about, the setting, the time/place, the plot details without giving away the whole story. You may put this synopsis on your wiki page or write it by hand and put into your visual journal. Wednesday-Friday: Finalize your book cover designs. Make sure that the cover fits the actual book. Due Exam day along with artist statement. Book cover will be presented on your actual book. ​Thursday: Meet with me to discuss your plan for the book cover design project. The following should be completed and prepared for this meeting. Tuesday 12/15: Work time to complete Infographics due next class. Make sure you have everything done for critique. Learning Targets: Present and Respond to final artwork through written and verbal critique process. Make sure your final Illustrator file is able to be printed 11 x 17 or 13 x 19 or 8.5 x 11. This project will be displayed like a poster, but will also be shown on screen. Make sure you have a completed artist statement that explains how you met the criteria and turn this into the class Google Folder. Make sure a copy of the final project saved as a jpg and turned into the class Google folder for the Critique. Make sure you complete the art project rubric and the artist statement rubric. After critique complete parent communication email about critique. See Google Doc for what to say. You will simply copy and paste the appropriate portion of the document. Make sure you copy your teacher on this email. Make sure if you are missing any of the above that you send an additional missing work email to parents and teacher. Begin wiki research and choose a book to design a cover for and plan photograph(s) that will be included in design. Develop thumbnails and other visual journal research to plan your designs. Thumbnails should show images and layout designs you are considering including the front, back cover, spine and flaps of the cover. See image below. Wednesday 12/23: Continue working on research using wiki and visual journals to plan book cover design. Learning Targets: Create an infographic for a real client. Connect to societal and historical contest of infographics, learning about their place in design. Monday- Friday: Work days to complete your Infographic. Make sure you are meeting the needs of the client and using colors, fonts etc that will work for their situation. Make sure a copy of the final project saved as a jpg and your artist statement are turned into the class Google folder for the Critique. Learning Targets: Research and develop a plan for Inforgraphics unit for a real client. Connect to societal and historical context of infographics, learning about their place in design. Monday: Finalize Wiki research and develop Visual Journal pages with thumbnails and other required elements planning for Infographic project. Fill out the Wiki/Sketchbook Rubric and start conferencing with me to discuss your plans for project. Continue editing and working on designs. Tuesday: Critique of Found Typography Inspired Project. Final project is prepared for presentation on mat board or as an actual product. Filled out grade rubric and artist statement rubrics have been completed. Thursday: Presentation of New Unit: Infographics- What are they and how do we use them? Research: Use the following wiki page to discover what Infographics are and how they are used in Business. Develop an understanding of how to create your own infographics. Create visual journal and wiki pages to illustrate your research and planning. Include full color thumbnails in your journal pages that brainstorm the composition and concept for your final Infographic. Work on Wiki research and Visual Journal notes, thumbnails on Infographics. Learning Targets: Create a real world application of your found typography inspired design using Adobe Illustrator and Photoshop. Monday-Friday: Work days to complete your real world designs for presentation for critique on Friday. Make sure you've finished off your work for presentation. Mat it or build it or do what you must do to make it a realistic presentation of your product, service or object. 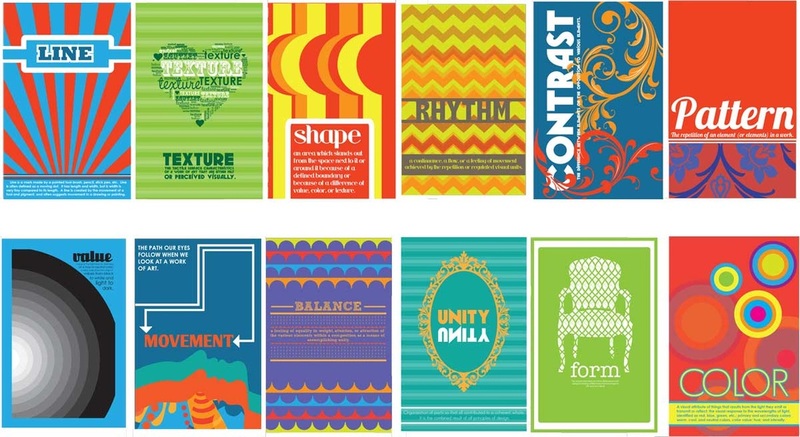 Tuesday 11/17: Critique of Found Typography Inspired Real World projects. Make sure your written artist statement is complete and turned into the Google Folder for our class. Tuesday: Sketchbooks and Research on Real Life application of Found Typography due with rubric. Conference with me to discuss your ideas, thumbnails etc. Get started in Illustrator and Photoshop designing the actual product, service, logo or other idea. Thursday: Continue working on Macs to create your design. Present 3 small collages that utilize found typography for critique process. Analyze collages through verbal and written critique process. Create a proposal and visual journal pages developing a real world application of Found Typography ideas. Monday: Critique of 3 collages on Found Typography-Make sure you have a written artist statement in the Google Folder, art rubric and artist statement rubric completed for critique. Send home the parent critique communication email. If we finish critique early continue with part 3 of this project. Scan collages and post in SHARE drive folder in Mac Lab. Make sure to name them your name-collage 1.jpg, your name-collage2.jpg and your name-collage3.jpg. Critique Pair/Share: Look at the person's work in the Share Folder and critique it on Today's Meet link. You will be limited to 140 characters per comment. Join the discussion by entering your first name initial (no space) So I'd be JeanneB. Post 1: Susan has great composition in collage # 1 that uses the word Believe. She used rule of thirds and has a lot of items touching the sides. Post 2: Susan could improve her use of Found Type in collage # 3. It seems like there isn't enough typography and too, much photography in this piece although the composition is cool. discuss the 3 cs of that person's work. discuss what they did well. How might you use this found type? Could it become a logo for a business, signage for a company, a stationary system, part of a Music cd/album cover, part of a website, an animated web graphic? Write an IT'S Clear proposal in your sketchbook about the application of your idea. Explain how you will further develop your found typography into this idea. Do whatever research you feel you need to further develop your idea. Develop 6-8 thumbnails of a real life application of your Found Typography. Full color (markers or color pencil please) Due by end of class today. Sketchbooks will be checked October 30th for these thumbnails and Visual Journal research on collage artists and your Typography ideas for Part 3 of project. ​Friday: Mac Lab work time to develop your proposed concept to bring this idea to life. Demonstration of Illustrator for typography. Sketchbook/Visual Journal pages due on all parts of this project thus far. Fill out a Sketchbook Rubric for Part 3 research. Also make sure the wiki rubric for Found Type Research and Collage Research are turned in. Research collage as an art form and connect to art historical artists who used collage. Create 3 small collages that utilize found typography. Tuesday & Thursday: Studio Work days to complete collages and visual journal research on collage artists and techniques. Critique of 3 collages next week Monday 10/26. Complete artist statement about collages, artist statement rubric and art project rubric. If you have finished your collage and Visual Journal research on collage, typography etc. Sketchbooks will be checked week of October 26th for these thumbnails and Visual Journal research on collage artists and your Typography ideas for Part 3 of project. Research the history of typography using the wiki resources to guide research. Research collage as an art form and connect to art historical artists who used collage. Create 3 small collages that utilize found typography. Monday 10/5: Continue researching new unit on Typography using wiki. There are 3 parts to the new unit. See the details in the assignment description here. Wiki research should be completed by the end of this class. Fill out the wiki rubric and hand in. Read the page on Typography first. Make sure you click on all the links and watch all the embedded videos. Once you've read this page you will do your assignment on this wiki page. Wednesday 10/7: Collage How To: Today we will learn some collage techniques. Your goal will be to do part 2 of this assignment, which is to create 3 small collages in your sketchbook. See the assignment sheet for details. How does each artist use collage? How do they use typography in their collages? Check out my pinboard on Collage. Check out my pinboard on Visual Journals if you're not sure what I mean by this term. Monday 10/12: Studio work time to develop 3-5 pages in your Visual Journal/Sketchbook with Collage artist research and Found Typography collages. Remember 1 of the 3 collages must be digitally created. Wednesday 10/14: No Classes College and Career Readiness Day. See Counselor Emails for details. Friday 10/16: Final day to work on your sketchbook collages. You should be starting to design and create the digital collage using Adobe Photoshop and found digital typography. Learning Targets: Present and Respond to student art designs via the written and verbal critique process. Research and Plan ideas for typography assignment using wiki and sketchbook to develop ideas. Thursday: Research new unit on Typography using wiki. There are 3 parts to the new unit. See the details in the assignment description here. Part 1 will begin today with wiki research. Create a unique abstract design using 1 shape and 3 colors to illustrate one of the three types of balance. Create a digital version of the design concept using images to create the shapes. Present and Respond to student art designs via the written and verbal critique process. Monday & Wednesday: Work to finish Shape Designs. Must be matted and printed for critique on Friday. Friday: Critique of Shape Project on Tuesday. Artist Statement, Art Rubric and Artist Statement Rubric all due. Create a unique abstract design using 1 shape and 3 colors to illustrate one of the three types of balance. Create a digital version of the design concept using images to create the shapes. Work in Art Studio 114: Complete cut paper designs (should be finished by end of today's class). Sketchbook thumbnails were due last week. If you missed this deadline see Mrs. Bjork regarding Parent Communication Forms. Thursday: Instruction in Mac Lab- How to create a digital version of your design. Will learn about photography in design and also how to use basic photoshop selection tools, layers and Hue/Saturation. Full color thumbnails are due at the end of class. Meet with me to share your designs. Get started on cut paper version of your design. Digitally start looking for images you want to use that are the colors you need. Doesn't matter what's in the image. Save these into a folder called Shape on your directory. Finish up the paper version of your design and begin creating digital versions in Photoshop. Directions on how to get started in Adobe Photoshop. How to shrink your design proportionately. After you've clicked the above links and bookmarked all, come back to the Class Wiki. You will be logging in using the following join code. Research Abstract shape designs via the class WIKI Find images on the Internet that use only shape and color as the elements of the design. Look for one example of asymmetrical, symmetrical, and radial, three total examples and post them to the WIKI. Then explain what you liked about the image you found and how it illustrates each type of balance. Wiki research due by the end of class. Thumbnails in full color due at end of next class. See assignment sheet below for details. Full color thumbnails are due at the end of class. Meet with me to share your designs. Get started on paper version of your design. Digitally start looking for images you want to use that are the colors you need. Doesn't matter what's in the image. Save these into a folder called Shape on your directory.